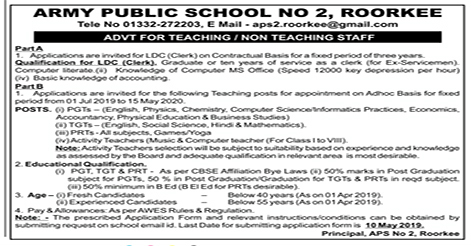 PRT's, Activity Teacher, Counsellor, Librarian & Supervisore Adm.
Army Public School No 2, Roorkee invites applications for filling up Teaching & Non-Teaching Staff. Army Public school released notification for the recruitment of PGT (, TGT, PRT, Activity Teacher & LDC post for various subjects on a contractual basis. Interested candidates may apply on before 10 May 2019. NIL 1. Graduate or 10 Years of service as a clerk (For Ex-Servicemen). 4. Basic Knowledge of accounting. 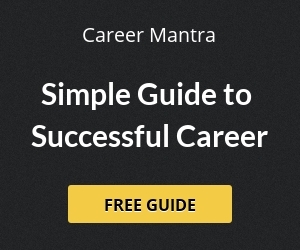 PGTs English, Physics, Chemistry, Computer Science / Informatics Practices, Economics, Accountancy, Physical Education & Business Studies As per CBSE affiliation bye laws. 3. 50% marks in Post Graduation / Graduation for TGTs & PRTs in reqd. subject. Activity Teachers Music & Computer Teacher (For Class I to VIII) Activity Teachers selection will be subject to suitability based on experience and knowledge as assessed by the Board and adequate qualification in relevant are is most desirable. Applications are invited for PGTs, TGTs, PRTs & Activity Teachers on Adhoc Basis for a fixed period from 01 July 2019 to 15 May 2020. The selection for the post shall be based on a personal interview. Interested & Eligible candidates can obtain the prescribed application form and relevant instructions/conditions by submitting a request on school email id i.e. aps2.roorkee@gmail.com. Last Date for submitting application form is 10 May 2019. Help us to improve this article/job posting "Clerk & Teacher Recruitment in Army Public School No.2 Roorkee". We would be glad if you can comment below and provide your valuable suggestions and feedback. If this page have any wrong information/list or out of context content, then you can report us as well. I’m interesting for PRT Teacher . So please send me application form on my mail id. sir, please provide me application form on my email and also tell me all essential condition about clerk recruitment. i am very greatful to you. Thankyou so much. I want to apply for Clerk post. And can you tell us what is the process for aply this post. Sir I have 5 years experience of clerk in I.T.I College. Please Send me an Application form on my email id. Sir, Please send me Application form.. I want to Apply for the post of Clerk. I’m interested for PRT teacher. So please send me application form on my e-mail id. Interested to apply for the recruitment.do mail me the application form for the same. I’m graduated from d.u. and I had btc degree instead of b.ed i.e. equivalent to b.ed. Sir/madam, Please send me Application form.